It is the belief of the Lower Shaw Farm that different species can live in peace and harmony, and this belief was reaffirmed by Maran Hen, who lovingly hatched three abandoned duck eggs that she found in a nearby shed. The hen stayed with the eggs until they finally hatched after 28 days, which is much longer than the normal incubation period of chicken eggs. 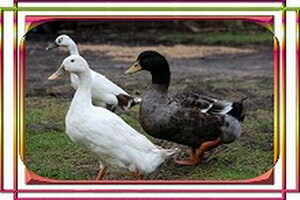 The mother hen and ducks now continue to live happily together amongst the mixed flock of birds that reside on this farm in the beautiful countryside of Wiltshire. 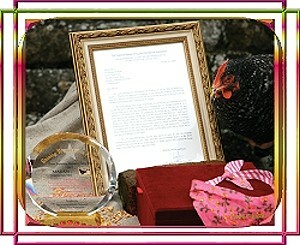 Upon hearing this wonderful news, Supreme Master Ching Hai bestowed the Shining World Love Award on Maran Hen, which was presented by our Association members in December Golden Year 5 (2008). After receiving a beautiful little neck scarf with the word “hero” from our loving Master, along with 60kg of grain to share with her large family of friends, the mother hen proudly rejoined her flock. Lower Shaw Farm currently offers the public an array of activities throughout the year including a Grow Your Own Fruit and Veg Club, Juggling and Circus Skills Club, Vegetarian Weekend Breaks and Courses, plus more. Thank you, caring Maran Hen, for setting such a good example of living in harmony with different species on Earth, as God intended.